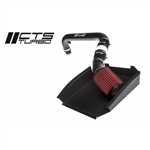 At CTS Turbo we are proud to announce our new air intake system for the EA888.3 VW/Audi range of vehicles. 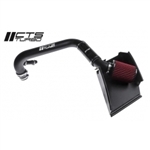 This premium Cold Air Intake kit was designed to work specifically with the New Jetta vehicles that come equipped with the 1.8TSI motor and 2.0TSI (EA888.3) on the GLI model. These cars do not use MAF sensors and have a black engine cover, it is also known as TSI GEN 3 motor. The OEM air scoop works in conjunction with our sealed airbox to seamlesly force cold air into our air intake system. Air then flows through our high flow cone air filter, which utilizes an inverted cone design for maximum engine breathing. Our CNC mandrel bent aluminum intake pipe allows for smooth entry of cold air into the the engine providing peak power gains ranging from 9-15WHP. All of the components included in the CTS air intake system work flawlessly together to provide increased horsepower and torque throughout the entire power band and an aggressive race-inspired sound. Note: breather filter is available in red only. At CTS Turbo we are proud to announce our new air intake system for the VW/Audi range of vehicles. The OEM air scoop works in conjunction with our sealed airbox to seamlesly force cold air into our air intake system. Air then flows through our high flow cone air filter, which utilizes an inverted cone design for maximum engine breathing. Our single piece CNC mandrel bent aluminum intake pipe allows for smooth entry of cold air into the the engine providing peak power gains ranging from 9-15WHP. By using a factory MAF housing, you can be sure that fuel trims will remain perfect. Please confirm if your car requires a breather filter for the secondary injection system: look for the hose connected to the airbox behind the driver's side headlight. NOTE: please note that your OEM MAF housing is used to connect the filter to the main intake pipe.